Today I wanted to share with you 2 cookbooks that I really have enjoyed using in this last year and a half adventure of being gluten free in our home. Now here is my disclaimer… I don’t know much about this! The recipes/cookbooks that I like may not be the healthiest that there ever was, but they work for us. My children do not have Celiac's Disease, so we do not have to worry about cross-contamination and all the other very specific needs of that disease. So with that said, here are the 2 cookbooks that I wanted to share with you. 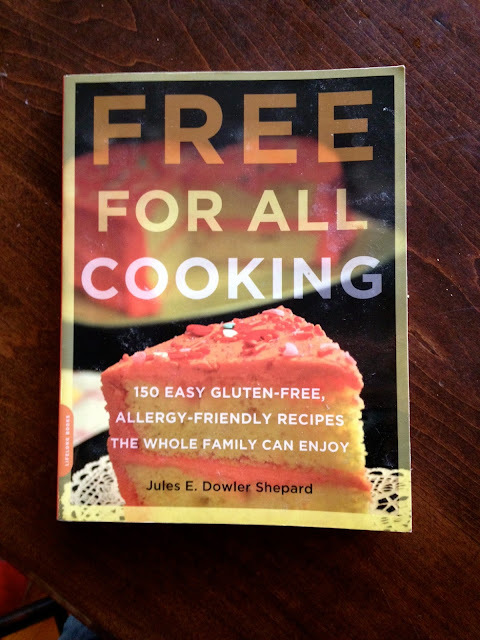 The first is Free For All Cooking by Jules Shepard. I also buy her flour mix. I have found her flour mix to be versatile and very convenient. I first started on this journey, mixing all of my own flours and it was very time consuming for me. With 10 kiddos, I need quick and convenient, yet homemade at the same time (come on…Sandra Lee has made a whole empire out of that attitude). There are so many recipes that I haven’t tried in here yet…but there are a few that I really like. The pancake recipe is what I use for all of our pancakes and waffles. Yummy. Her zuchinni bread recipe is really good. She even has a reipe for homemade poptarts. Tried those! Pretty time consuming but my son really liked them. Just for the record, she has a regular Cake mix Doctor cookbook too. Give it a try… gluten free or not, you can’t go wrong with these cake mix cookbooks. Carrie Heard is a fantastic mother of ten kids (as of now;) that range from the ages of 18 and 6 months. She homeschools, cooks, cleans, and does all the practical things a mom should do, but balances the loving and disciplinary work extraordinarily well. She loves trying new styles, thrifting, and decorating her home tastefully on a budget.